Since the dawn of the industrial revolution in the eighteenth century, man’s manufacturing paradigm has remained largely unchanged. Prior to this, artisans manufactured goods by hand or with very basic machines. These craftsmen produced a modest supply of similar albeit unique pieces, rather than the slew of identical instances of the same product we are so accustomed to. This sort of manufacturing requires a great deal of problem solving at the hands of the artisans– without standardized parts, each piece presents its own unique challenge. These “wildcard” problems and the skilled workers required to solve them, have historically served as the major limiting factors to the supply of manufactured goods. With the advent of new technologies, and a surplus of unskilled workers at its disposal, industrialization set about meeting and exceeding the current demand for manufactured goods through a number of key shifts to the philosophy of production. By utilizing powered machinery, a higher number of interchangeable parts, and expansive industrial facilities, unskilled workers could replace the artisans. This allowed nearly anybody to manufacture goods without prior knowledge or even physical strength. The need for the comparatively slow hand of the artisan was beginning to fade. 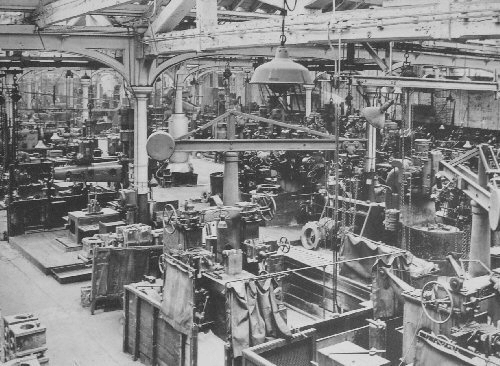 Today, the manufacturing industry may seem a far cry from the factories of the 1800’s but it has only changed and evolved in superficial ways. The assembly line, the factory, and the interchangeable worker remain central to mass production. While these are simply accepted as the very nature of industry, the requiem bells have already begun to toll for what is slowly becoming an entire industry of anachronism. We find ourselves situated on the precipice of the information revolution that has only just begun and will prove to be the end of our current manufacturing philosophy. Information, just as in humans, has made our tools smarter than ever before. Take for instance some of the staples of modern manufacturing; CNC mills, Laser Cutters, 3D printers, etc. these machines are able to break down the barriers that once stood between a man’s vision and the reality of a final product. In many cases artisan quality can be replicated, or even exceeded with mechanical precision quality that had been mostly absent from mass-produced products since their inception. This is particularly true about industrial equipment, tools, machines, and their ilk. They have benefitted immensely by the more exacting specifications that components can meet compared to older techniques which may sometimes lead to stacking tolerance issues. In the past decades, society has begun to accept that an immensely profitable web startup can simply take the form of a few determined individuals with lap tops in a garage. In the coming decade we will begin to see the same trend emerging in physical manufacturing as well. Take for example both the Laser Cutter and the 3D printer. Both have tremendous applications for manufacturing especially on the small scale. Both are recent technological developments, both were once cost prohibitive and yet both have become widely available to the d.i.y. market at an affordable price point either from retailers or the many widely available internet build guides. Now they allow passionate people to create the products they have always dreamt of with nearly no overhead cost and no scaling. This is only the beginning; in fact, the concept of smart tools is truly a stepping-stone to smarter materials. Materials that can assemble themselves within exacting tolerances have immense implications for the quality of mechanical goods and are assuredly the next evolution of industry towards energy efficient, zero waste, crowd sourced network in much the same manner that information, software; the intangible, have made a home on the internet. Buy and sell modern machine tools here.